If you are heading to Fire Island then the Fire Island Ferries can help you reach Saltaire, Ocean Beach, Atlantique, Kismet, Dunewood, Fair Harbor, Seaview, and Ocean Bay Park. The peak service is from May through September although there is service year round depending on the weather. No vehicles are allowed and the crossing is about thirty minutes from the Bay Shore to the Island. The schedules for the ferries range from 7 am in the morning until 9:30 pm however depending on where you are going to or leaving from will affect the schedule. Some ferries leave much earlier than others and Kismet is a good example. Since you can't take your car to Fire Island you will need to leave your car parked somewhere. The Fire Island Ferries has parking for you beside each of their terminals. There are no reservations and parking is on a first come first served basis. Motorcycles pay the same rate as cars and parking is paid only in cash. Ferries may be chartered for private use but reservations must be made at the ferry office. Consider celebrating a birthday, wedding, anniversary, or another big event aboard one of the ferries or use them to transport your guests to an event on Fire Island. The history behind Fire Island is really interesting and ferry service to the island began in 1856. As more communities developed on the Island more ferry services were offered and there were lots of different options. This included sailboats, gasoline, diesel, naphtha, steam, and everything in between. More than 90 different ferries have carried people across to Fire Island. This includes clam dredgers, rum runners, fishing boats, and yachts. There are others that were actually built as ferries to provide ferry service. 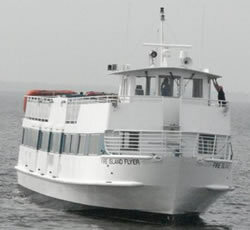 If you are heading to Fire Island then the Fire Island Ferry service can meet your needs. Just check out their website at http://www.fireislandferries.com or give them a call if you have specific questions you don't find answers to online. Fire Island Ferry Services from Bay Shore to Bay Shore, Kismet, Saltaire, Fair Harbor, Dunewood, Atlantique, Ocean Beach, Ocean Bay Park, and Seaview.